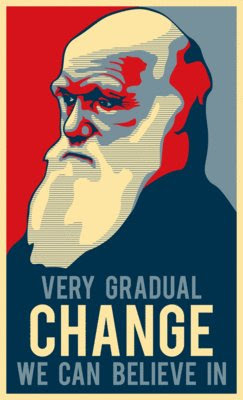 We missed it by a week or so, but Darwin's 200th birthday was on February 12th, and there have been numerous events on university campuses across the U.S. over the course of the month. This image just got passed on from some anthropology friends, and we couldn't resist sharing it. While we're at it, check out these interesting articles from the TimesOnline (UK) about the Vatican declaring the work of Darwin to be compatible with Christian faith. And be sure to check out the video on the page as well which explains why and how Darwin has remained relevant and influential for so many years.